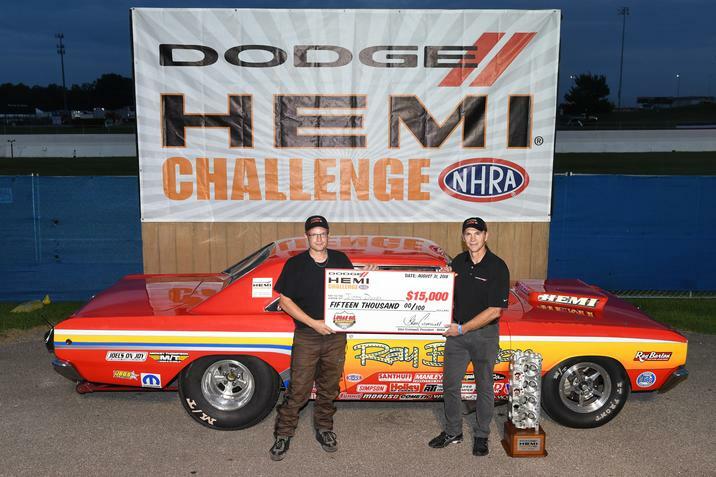 James Daniels won his first Dodge Hemi Challenge title at the age of 20 in 2016 and three years later he still hasn’t lost a round at the prestigious event. 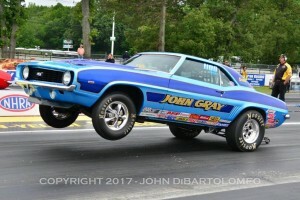 Daniels ran his win streak to three when he stopped low qualifier Gary Wolkwitz in a final round battle featuring a pair of Hemi-powered ’68 Dodge Dart factory race cars. 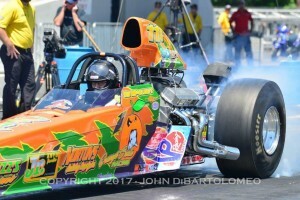 Off the starting line first, Daniels powered to an 8.622, 156.15 for the win after Wolkwitz shut off at half-track. For the win, Daniels received $15,000 and the coveted SS/AH class champion’s trophy from the Chevrolet Performance U.S. Nationals. 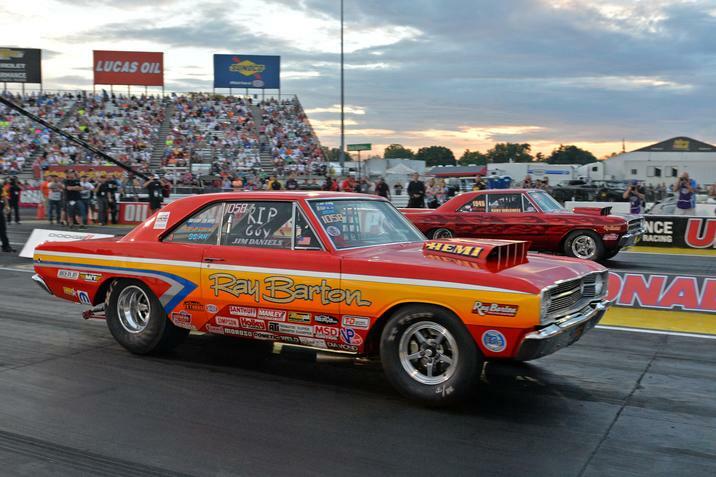 The Dodge Hemi Challenge is one of many events that help make the U.S. Nationals special. 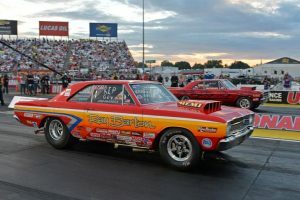 Featuring 1968 model year Dodge Dart and Plymouth Barracuda factory race cars, the Hemi Challenge is part of class eliminations for Super Stock racers. In celebration of the 50th anniversary of the program, a huge field of 28 cars made their way to Lucas Oil Raceway Indianapolis. Daniels came from the No. 2 qualifying spot to work his way through the field with wins against Mark Howes, Dan Zrust, and Russ Campbell. Daniels made his best run in the semifinals with an 8.511 against Campbell’s Missouri Mule Barracuda. 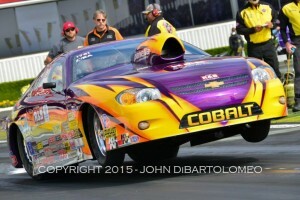 Daniels also made consistent runs of 8.52, 8.54, and 8.57 during Friday’s eliminations. 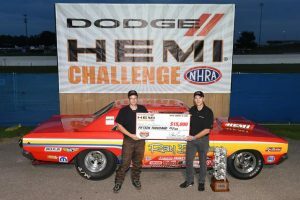 Daniels has now won the Dodge Hemi Challenge three times but, the 160-mph Dodge Dart that he drives has won this event on five occasions. Engine builder David Barton won the Dodge Hemi Challenge title in 2000, and Daniels’ father, Jim, earned the title in 2010. 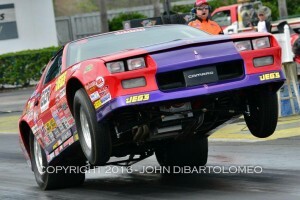 Wolkwitz was the low qualifier with an 8.524 pass in his Whitehouse Station, N.J., based Dodge. After a bye run in the first round, Wolkwitz made his way to the final after wins against Wendel Howes, former Hemi Challenge champ Bucky Hess, and Gus Mantas, who fouled in the semifinals. Wolkwitz was also the low qualifier for last year’s event.